Akron Triviators: Get to Trivia with All Deliberate Speed! Get to Trivia with All Deliberate Speed! Brie-mund is my everything right now. 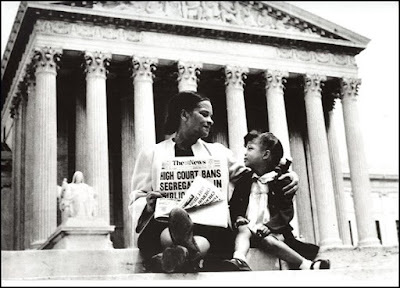 In actual news, today is the 62nd anniversary of the Supreme Court's decision in Brown v. Board of Education of Topeka, Kansas. It overturned more than half a century of legal segregation in American schools, becoming enshrined in the wake of an 1896 Supreme court case. Who was the only Supreme Court justice who dissented from the majority in the 1896 landmark case that established "separate but equal" as the law of the land? Hail Eris! 5 Confusion? 8pm Trivia! Happy Birthday, Mrs. Reynolds! Trivia tonight!